Dearie me! Can it really be three months since my last blog post? Doesn’t time fly when you are having fun 🙂 I am thoroughly enjoying this term as I am bumping into things that I was aware of this time last year. Although I wasn’t actually in post until the August I had been through the interviews by now and met some of the children and staff. I had also popped into school to visit the Summer Fayre and meet some of the Parent Council and other families. So this song seemed like it met the criteria, it also sounds like a properly summer song to me so a winner on both counts! Again I’m not a huge fan of the genre, but the thing I particularly like about the Average White Band is that that they kind of defy expectation. If we knew of a band from Scotland with members including Alan, Robbie, Hamish and Malcolm, hands up who would expect them to sound like this! That defiance of expectation really tickles me and is something that is regularly floating about in my mind. so there will be a good number of new faces around the place next session but our core business remains the same . We work closely as a team around our children to support and challenge the attainment and achievement for all of our pupils; understanding and taking account of all factors that influence them. We are also really looking forward to sharing the plans for next year. 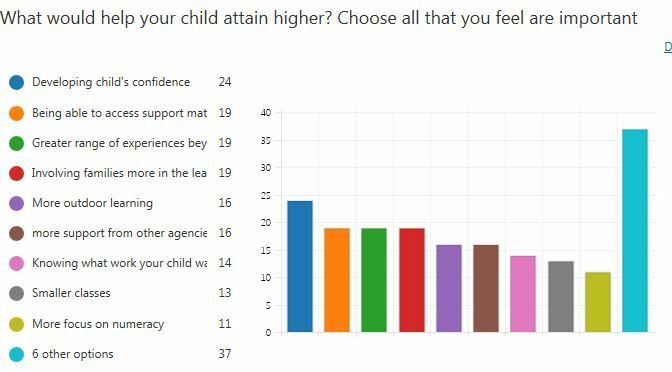 The School Improvement Plan is in place, supported by the contextual analysis outlining the main areas for development and driven by the feedback from families, outlining the barriers to children attaining as highly as possible.